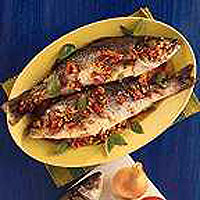 Stuffed with tomatoes, basil and pine nuts, then baked in foil, the sea bass is moist and full of flavour. Heat the oil in a frying pan, add the onion, tomatoes and garlic and cook gently for 5 minutes or until soft. Season, then add the pine nuts and basil and cook for a further 2 minutes. Stuff both fish with the mixture, and place each fish on a separate piece of well-greased foil. Wrap into a tight parcel. Place on a baking tray in a preheated oven 190ºC, gas mark 5 for 25 minutes or until cooked. The vinaigrette: whisk together the olive oil and balsamic vinegar in a small saucepan. Add the tomatoes and shallot, season and gently warm through. Check that the fish is cooked; the flesh should be firm and flake easily. Remove from the foil, transfer to an oval plate and spoon the dressing over the top. Garnish with chopped basil leaves.